I really want to thank everyone who has supported the release of my debut cozy mystery. 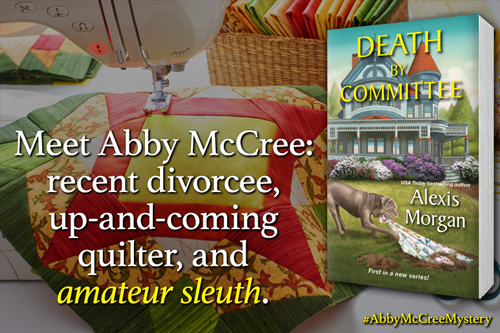 The reviews of the first Abby McCree Mystery have been most kind, which I greatly appreciate. Even more exciting, though, was finding out that DEATH BY COMMITTEE hit #44 on the USA Today's Best-selling Books List Top 150 for the week of March 17th! Needless to say, I was thrilled. Meanwhile, I just finished the next round of edits on the second book in the series. DEATH BY JACK-O'-LANTERN will be out in just about five months, and I can wait for you to find out what Abby is up to next. That's all the news for this month, but don't forget to check out the latest interview on the Snowberry Creek page. And for the Paladin fans in the audience, I've posted a special surprise in the A Little Something Extra section of the website. It's a downloadable PDF of the serialized story I did some time ago about Barak q'Young and Lacey Penn-his proposal, the bachelor party, and their wedding. Enjoy!